The spire of Trinity Church is visible behind Queen Anne Square. This seating area, one of three that make up Maya Lin’s installation, suggests domestic life. NEWPORT, R.I. — The hiss of air spades and the rumble of cement mixers have ceased. The trees have been planted, and the sod placed. The shady, green square that offered rest and respite to travelers in Colonial times has come full circle. When it reopens on May 31, Queen Anne Square will pay tribute to three women whose vision has left an enduring mark on Newport: Queen Anne, who ruled England from 1702 to 1714 and supported the Anglican Church in general and Newport’s Trinity Church in particular; Doris Duke, who created the foundation credited with preserving Newport’s Colonial architecture; and Maya Lin, one of the world’s foremost landscape architects, perhaps best known for the Vietnam Veterans Memorial in Washington. The land between Trinity Church and Thames Street, in the area known as “The Hill,” was a center of village life as early as the mid-1700s. During the economic boom of the 1960s, a hodgepodge of commercial buildings spread across the space, nearly obscuring the historic church. In the mid-1970s, Duke, a philanthropist and summer resident of Newport, spearheaded the effort to create a park to be known as Queen Anne Square. In cooperation with Trinity Church, Duke’s Newport Restoration Foundation oversaw the removal of the commercial buildings and the site’s return to a village green. Forty years later, the foundation has reinvented the square once again, with an eye toward honoring Duke’s preservation efforts, highlighting the role of historic preservation in community revitalization, and celebrating Newport’s history and assets. Since Duke (1912-93) founded the organization in 1968, the foundation has restored or preserved 83 buildings and today owns one of the largest collections of Colonial architecture in the country. Most are rented as private residences to tenant-stewards. Buildings open to the public include The Whitehorne House, a Federal-era home with a rare collection of 18th-century American furniture; Prescott Farm, featuring 40 acres of green space and a collection of historic buildings; and Rough Point, Duke’s mansion on Bellevue Avenue, overlooking the Atlantic. The foundation also offers Newport History Tours, 75-minute walking tours, in conjunction with the Newport Historical Society. Lin’s installation at Queen Anne Park, titled “The Meeting Room,” is a series of three seating areas designed to encourage rest, reflection, and conversation. 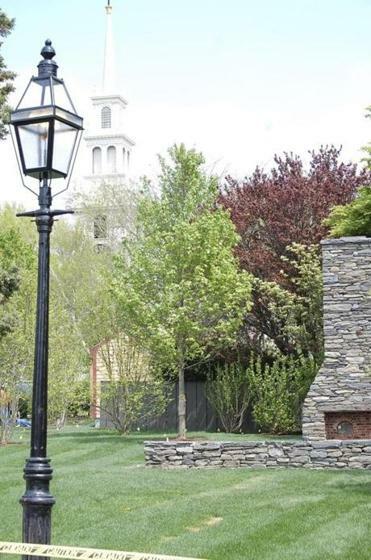 Seating areas are set on stone foundations that form outdoor rooms representing the scale and type of materials used in Newport’s historical buildings, and each is meant to reflect an aspect of life in Newport. Stone thresholds at the entrance to each installation are inscribed with quotations from Newporters that capture the theme. Nearly every element of the park reconstruction is home-grown. The three foundations are built from native Aquidneck Island stone, reclaimed from local historic houses that have been placed on new foundations. The benches are fashioned of local shale. Under the direction of landscape artist Edwina von Gal, who has collaborated with Lin on several projects over the last decade, new tree plantings were chosen based on native species that have historically grown in Newport. The inscriptions — including one from the Charter of 1663 (known as the King Charles charter) for the Colony of Rhode Island, the first document in the English empire to legislate freedom of religion and separation of church and state — have been hand-engraved by Newport artist and stone carver Nick Benson. In conjunction with the reopening of Queen Anne Square, Rough Point is focusing on Duke’s philanthropy with a special exhibit entitled “A Career of Giving: The Surprising Legacy of Doris Duke.” Through photographs and artifacts, the exhibit paints a picture of the extraordinary range of Duke’s interests and largesse, from Little League teams to the Rosebud Sioux Indian tribe in South Dakota, who gave her the American Indian dress and accessories on display. As they leave, visitors can choose a charity to support from several representing Duke’s interests and cast their vote with chips. When the exhibition concludes, Rough Point will distribute money based on the votes. Friday’s opening ceremony at the park begins at 10 a.m. It will include remarks by Governor Lincoln Chafee, Dr. Roger Mandle of the Doris Duke Monument Foundation board, and Mayor Henry F. Winthrop. QUEEN ANNE SQUARE Bordered by Church, Spring, Mill, and Thames streets. ROUGH POINT 680 Bellevue Ave., 401-847-8344, www.newportrestoration.org/visit/rough_point/. Through Nov. 9. Adults $25, children under 12 free.